In the case of fish farming in fish ponds, water intake protection against foreign fish entering from outside is a major problem. Foreign individuals pose a risk of disease transmission, which could cause serious damage to the stock of farmed fish and thus financial losses. Dense grilles do not guarantee protection against the ingress of fish and, in addition, require frequent cleaning, which increases the maintenance costs. 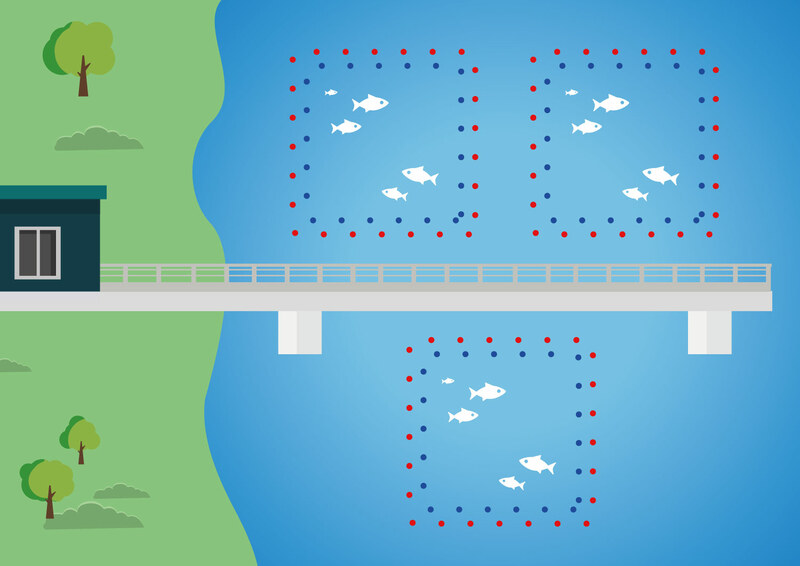 By installing the NEPTUN system on the water intake inlet in the form of a row of positive and negative electrodes, between which an appropriate electric field is generated, we deter fish from entering this place. This provides additional protection for the intakes and complements the installed grilles. Another problem is the protection of fish farms or the protection of farms against predator interference. Protective nets are the current way of protecting farms. Quite often, however, such nets are damaged by predators, which results in the decline in fish populations and their escape from farming. Using the NEPTUN system, i. e. by installing two positive electrode rows and one row of negative electrodes, and by creating an appropriate electric field between these rows, we can protect the fish farm from predator interference and at the same time prevent farmed fish from escaping..
By installing the NEPTUN system on the water intake for fishponds, we gain an additional safeguard supporting the installed grilles. It increases the likelihood of preventing unwanted fish that can transmit the disease from entering, which averts negative financial consequences. The NEPTUN system installed in front of protective nets protects them from damage caused by predators and does not allow farmed fish to escape if the nets are damaged.